The time of year when the stores are full of all the wonderful things to get students ready for school, backpacks, pencils, sharpeners, binders, and paper galore. It has been so much fun this year getting Jasmine ready. She picked out her own tablets and pencils. She helped pick out some of her curriculum books. She did everything with such enthusiasm. It’s all new and exciting to her. Jasmine has given me a new appreciation for learning. I have always been appreciative of our education system and the possibilities that lay before our children, but Jasmine has given me new eyes to see just what a blessing the gift of learning is. I wish I had the words to properly express the joy that learning brings to her. Jasmine doesn’t take learning for granted. Many of our children tolerate education, they sometimes love it, but I do not believe they truly appreciate it like a child who has been denied it for years. Jasmine had a year of school before she was abandoned at 8 years of age. She had some schooling during the first year in the orphanage, but was then excluded from school because of her disability. 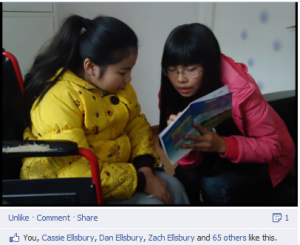 She was in a wheelchair, and the schoolroom had been moved to the second floor of the orphanage. They had no easy way to get her to the second floor, so she was left out. Why they didn’t they just bring her some books or worksheets? For years, Jasmine longed to go to school. For years she dreamed of being able to learn more. For years she sat in a room in her wheelchair, knowing that just one flight of stairs away was everything she longed for. It wasn’t until years later that Love Without Boundaries was able to get her a tutor as part of a new educational program started in her school – an LWB “Believe in Me School”. Right before we traveled to meet Jasmine, she was given the opportunity to learn English. It was such a gift and she had such joy about the opportunity. Her tutor was very kind to her and the English she learned made her initial transition much easier for her and for us. It is such a joy watching this sweet child learn. Her brain is a sponge, and she is eagerly absorbing every bit of information we can throw at her. She is learning a new language, a new culture, and years of basic knowledge at a rapid pace – all while smiling her dazzling smile and asking for more. With the vast amounts of trivial information we are bombarded with 24/7 – news, tweets, YouTube, Facebook, etc – we forget what a privilege it is to simply learn. We are rarely denied access to our information sources – but when the WiFi goes down, the power goes out, or you lose your cell phone – panic ensues. Perhaps, like Jasmine, you should exercise your freedom and privilege by picking up a book and engaging in the sweet joy and privilege of learning. As we were getting our school room ready, Jasmine asked me how long I have been homeschooling. I had to stop and think about it for a while. I first started homeschooling when Zach was in 4th grade and Cassie had just started kindergarten, which makes the grand total 17 years. We were about half-way through Cassie’s kindergarten year when I realized that maybe my children would be better suited for schooling at their own speed at home. Zach came home talking about how bored he was and Cassie was constantly frustrated that they wouldn’t let her read chapter books and they kept making her read the little kid books. I started to question why we were paying for a Christian education only to have my kids come home and want to do more. It wasn’t that the school was bad or lacking in what they were teaching. My children just needed something different than they were getting in school. The school just wasn’t prepared for a kindergartner that read at the eight grade level. There were no talented and gifted programs in the elementary school we started Zach in or the Christian school we transferred him to. The Christian school was a year ahead of the public school in the level they were teaching, but Zach still wanted more. My father-in-law had been telling me for years that I could do this, but I believed all the things others were saying. My kids wouldn’t be social. Kids want to go to school. They need to be around other kids their own age. You can’t provide the same type of education that a school can. They will fall behind. They won’t be able to get into college. They will miss out on opportunities that only a school can provide. They won’t be able to play sports. The list went on and on. This list put fear in my heart and kept me from doing what I should have done for Zach in first grade. What they don’t tell you is that schools allow dual enrollment. You can take the classes you need there. You can play sports at the school. You can take art and music. You can do your yearly testing. In our school district, you can even ask for a homeschool adviser. We have had the same homeschool adviser for over 10 years now. We love Ms. Deb, as the kids call her, she is like family. If I get stuck trying to figure out how to help my child learn a certain task, she is there to help me out. It’s much like our o.t. and p.t. and speech person. I don’t need someone to do my work, but I would be the first to admit that there are others who know more than I do. Just teach me how to do it and I will apply it. Sometimes we all need a new eye on the area we need help with. I am so happy that we started homeschooling. It has allowed me to be flexible with our hours and the days that they attend. Every one of the children under Cassie’s age have a health issue. 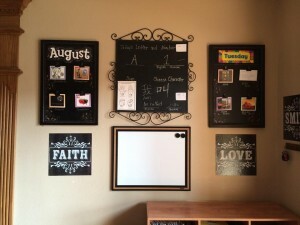 Homeschooling allows us to go to doctor’s appointments without missing school. It allows for surgeries. It allows for long hospital stays. It allows for no school on each child’s birthday. It allows me to be able to go slower in the areas where they need a little more work and faster in the areas where they excel. It allows me to have lots of time with each child in our unique, large family. There is nothing like being able to call a “mommy needs to snuggle with her littles” day and just hang out and watch a movie. As long as I get the allotted number of days in and they get their work done, we are allowed to take a free day here and there. This year we decided to do something a little different with the way the children learn. Cassie and Zach were easy to teach because they could read anything and remember it. They were the type of students that every homeschooling mom should be blessed enough to start with. Both Cassie and Zach always tested at the top of their groups and did exceedingly well on their ACTs. They had no trouble getting into college. But the middles all learn differently. They do better with visual aids. They do better with repetition. They like to learn by songs and videos and pictures so instead of workbooks and lots and lots of reading, which Jasmine and Gracie have trouble with, we decided to go back to the old days of the one room classroom and work on some subjects together. I put together a wall in my kitchen with two boards each holding four different subjects. On the back of each of those cards are three easy questions, for Grace and Jasmine, and three hard questions for Hope. I have a large white board that I write out the question for all three of them. They copy the question in a large binder with nine different subject dividers in it. Eight for each of the cards and graph paper for practicing writing Mandarin. It helps their penmanship. It helps them with sentence structure and the larger words that Jasmine hasn’t picked up yet. Since Hope writes quicker then the other two, Hope does an easy and a hard question. Jasmine and Grace do an easy question each day. On Thursday, they have to research a fact that we haven’t learned to share with me and then we review everything on Friday. Dan and I decided to do things this way after sitting down and deciding what it was we wanted the children to learn. We wanted them to memorize Bible verses so they could recall God’s promises in times of need. We wanted them to be able to recall a couple of basic facts about the subjects that we felt they needed to learn. There is no way everyone remembers everything they read unless they are like Zach and Dan. (We won’t even go into that subject.) We wanted them to be proficient in Mandarin (both written and spoken) and American Sign Language. The children should be trilingual by the time they graduate. Elijah, who is two, already signs well over 100 words. The littles sit at the table and listen too. They have already started learning. I found these chalkboards at Hobby Lobby for 90% off. It cost me only a few dollars to put it together. I had been printing off questions and figuring out my own, but we found these games called Professor Noggins. There are unlimited subjects in which to study. On the back it has three easy and three hard questions. I have added more or different questions when necessary. 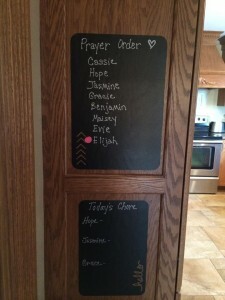 We found stick on chalkboards at Target that are little signs like the faith and love ones below the question boards to the larger ones that show the rules of the house. We even have a sign for daily chores and the prayer order. 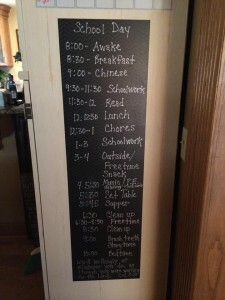 Everyone knows their chores, like taking out the garbage and recycling, so this chore list is for the extra things each of them need to do each day. The prayer order list is because the littles actually fight over who gets to say the prayer. They all want to be the one to give thanks for the meal and I could never seem to remember whose turn it was. 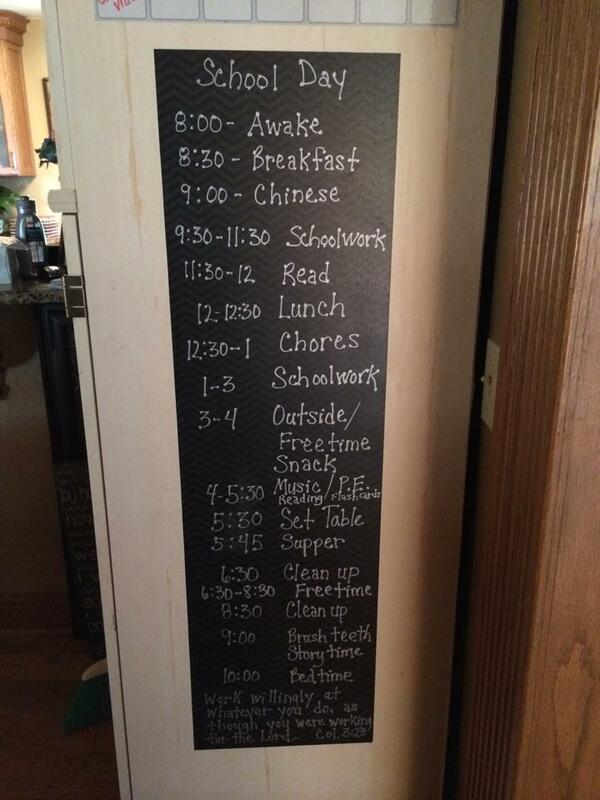 This list has saved mommy lots of headaches. 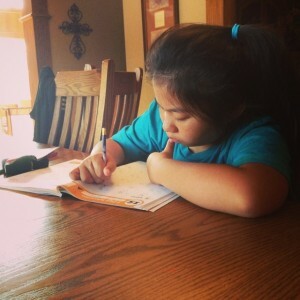 Jasmine has added new energy into our homeschooling. I like the new way of doing school. Instead of running from child to child doing workbooks all day long, half of our time is spent talking about different subjects and learning together. Jasmine’s excitement has rubbed off on all of us. She has given us all new eyes on the gift that learning is. It truly is a blessing!